Shannon Stevenson chairs the firm’s Trial Department and serves on the Executive Committee. Ms. Stevenson is a seasoned trial and appellate advocate and leads the firm’s appellate practice group. She has briefed and argued numerous cases before state and federal appellate courts throughout the Rocky Mountain West. 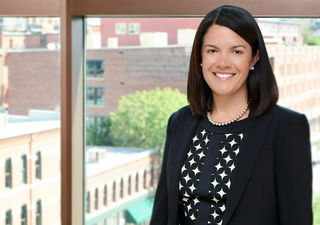 She has also litigated, tried, and arbitrated a wide variety of cases for clients in the energy, natural resources, and construction sectors, including disputes over royalties, implied covenants, environmental contamination, coal contracts, construction defects, product liability, personal injury, and shareholder disputes. Ms. Stevenson is active in the Colorado legal community. In 2014, she was appointed to the Supreme Court Judicial Nominating Commission, which recommends candidates for the Colorado Supreme Court and Court of Appeals. She currently serves as a member of the Colorado Judicial Institute Board and the Law Alumni Advisory Board for Duke Law School. Ms. Stevenson has served on the Board of the Colorado Women’s Bar Association since 2008, including as its president in 2013-2014. She is a member of the American, Colorado, and Denver Bar Associations and serves on the Denver Bar Association’s Board of Trustees. Ms. Stevenson is also on the Board of Governors for the Denver Metro Chamber of Commerce. Ms. Stevenson also has been active in pro bono representation of clients in the state and federal courts of appeals, including handling numerous appeals on behalf of indigent prisoners as a member of the Tenth Circuit’s Criminal Justice Act Panel. Ms. Stevenson received her J.D. from Duke University School of Law where she was editor-in-chief of the Duke Law Journal. After law school, Ms. Stevenson clerked on the U.S. Court of Appeals for the Honorable David M. Ebel. ASARCO v. Atlantic Richfield Co., CERCLA contribution action (U.S. Court of Appeals for the Ninth Circuit). Christian, et al. v. Atlantic Richfield Co., 100-plaintiff toxic tort action related to former copper smelter site (Montana Supreme Court). Hartman v. Ultra Resources, Inc., et al., dispute over net profits interest in Pinedale leases (Wyoming Supreme Court). Ridolfi v. Riddell, Inc., personal injury action based on brain injury to high school football player (Colorado Court of Appeals). Haralampopoulos v. Kelly, medical malpractice action concerning hearsay exception for statements made for purposes of medical diagnoses or treatment (Colorado Supreme Court).